I’m often asked what our typical homeschool day looks like. Whether you already homeschool or you’re thinking about homeschooling it’s fun to take a peek into another homeschool family’s daily routine. I’m happy to share our current homeschool schedule with you! Our daily homeschool schedule varies depending on the time of year and what other obligations we have at the time. When my children were younger (we started homeschooling when they were six, four, andtwo) our day looked much different than it does now. Homeschooling took place throughout the day and we weren’t as structured. As they got older, we’d do with all three boys together on some subjects and alone on other subjects. Then, when I went back to work full-time (they were eleven, nine, and six) the older two worked independently (their care provider was not asked to do any school work with them) and my youngest worked on some schoolwork with his care provider. You can read about my experience with working full time and homeschooling when my children were younger. I also wrote a quick day in the life of working full time and homeschooling when my children were a little older and my youngest was no longer going to a separate care provider. Now that I’ve quit my job to be self-employed our daily homeschool schedule has changed again. While I love that my boys were able to homeschool independently while I was working full time I’m glad to have a consistent time with them each school day to go over new concepts. Our family enjoys the benefits of homeschooling year around. Since we don’t take the summer months off from homeschooling we are able to have shorter homeschool days and take more time off during the school year. We currently homeschool on Monday, Tuesday, Wednesday and Thursday. In the past we homeschooled on Monday, Tuesday, Thursday, and Friday. Homeschooling doesn’t take much time each day with just three kids. I’ve written before about how much time it takes to homeschool. Of course, it varies from one family to the next and it’s even varied for us depending on how old our children are, what we’re learning about, and how independently they are able to work on a subject. Right now homeschooling takes us about 3 hours per day, 4 days per week. 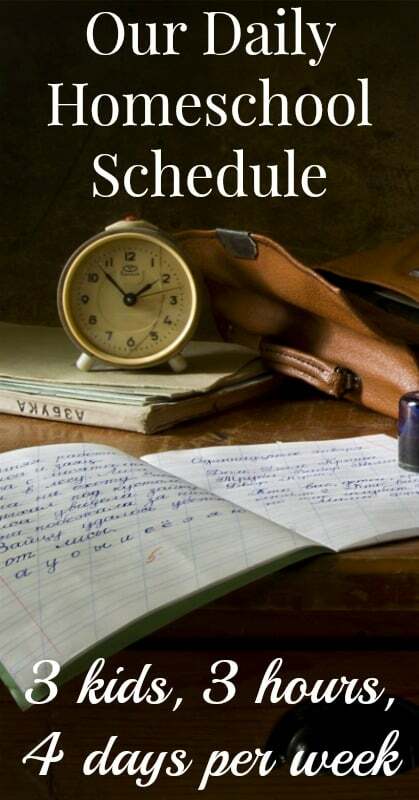 Scroll down for our daily homeschool schedule. 10:50 AM – 11:10 AM: Social Studies/Spirituality/Character Education/Critical Thinking/Emotional Intelligence, etc. (We’re currently watching Crash Course Philosophy and US Government. We do language arts from 9:00 AM – 9:20 AM instead of just math. We still do what I call “daily operations”, which consists of the boys doing two-minute drills on all of the four basic math operations. I try to end our school day by noon so we can have lunch. I leave a ten-minute buffer at the end of the morning in case we run over. If I see that we’re behind and might go past 12:10PM, we don’t do journaling that day. Usually, though, we’re right on time! As you can see from our daily homeschool schedule we’re only focused on school for three hours per day. So what does the rest of our day look like? What do homeschoolers do all day? At 12:00PM we have lunch. Chores are done at 12:30PM. The boys usually have free time from 1:00 – 2:30 PM. They eat a snack at 2:30 PM. My oldest and youngest have additional training and then practice that begins around 4:00 PM. They remain at the field with my husband (who coaches two soccer teams) until his last practice ends around 8:00 PM. When we drop off my other two sons at practice, my middle son and I run errands. Then we head home to make dinner. I usually get some work done during this time, as well. On non-soccer days or when it’s not soccer season I get much more work done. When we don’t have practice, my boys have lots of free time to play (both outside and on electronics inside), be creative, or just sit still and think. In addition to homeschooling my children, I’m also self-employed. The work times listed in my daily schedule are likely to be interrupted as the boys need me, but that’s why I love working for myself. I have the freedom to put work aside and take care of real life as it happens. Sometimes, though, I tell the boys we’re on “fire, blood or broken bones”, which means they are not to interrupt me unless there is an emergency. We keep it pretty balanced. That’s a typical homeschool day right now. Of course, it changes from time to time. And, we’re always sure to encourage learning outside of school time and pursue the interests of the boys even if we aren’t currently studying them. Check out our Winter Homeschool Schedule and our Spring Homeschool Schedule!